it’s a sweet potato party! 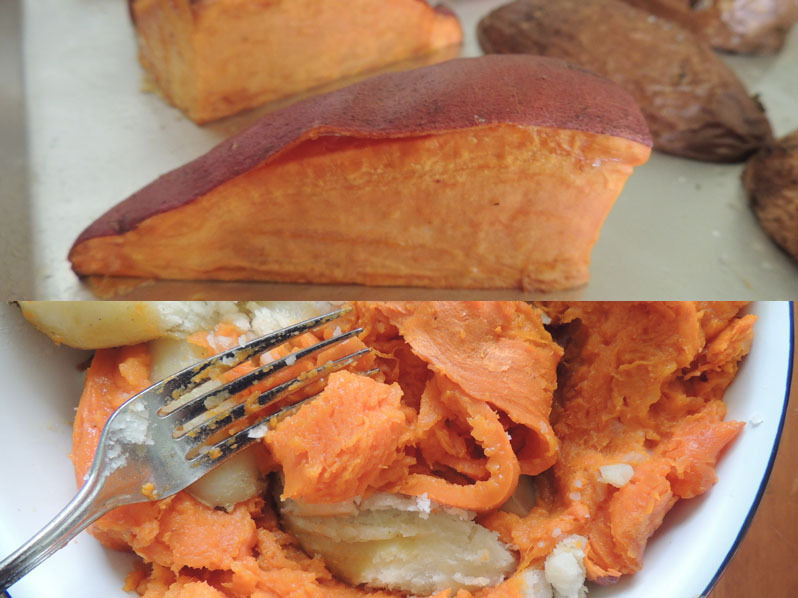 I had two gorgeous sweet potatoes (or yams?) sitting on my kitchen table for a while and I wasn’t sure what to do with them. Mashing them seemed so…boring. 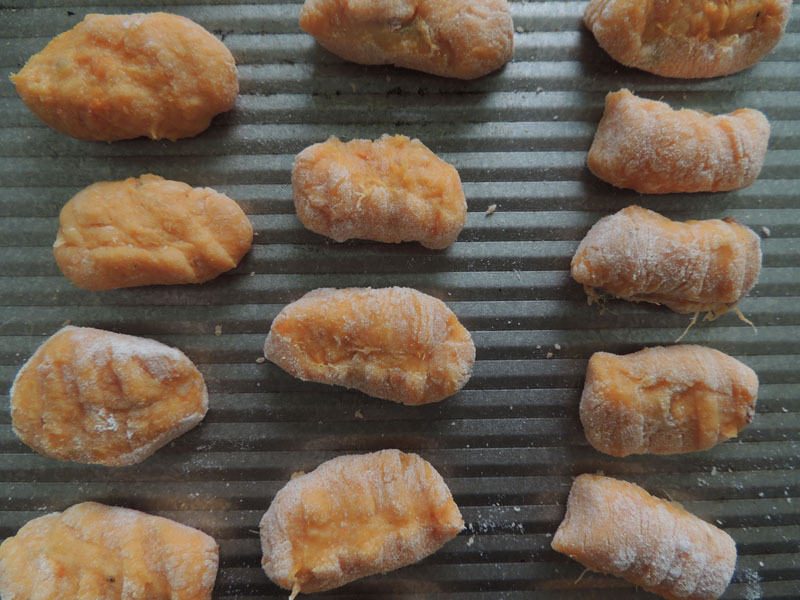 I ended up making these lovely gnocchi – though I have to say, I ended up with way more gnocchi dough than intended! 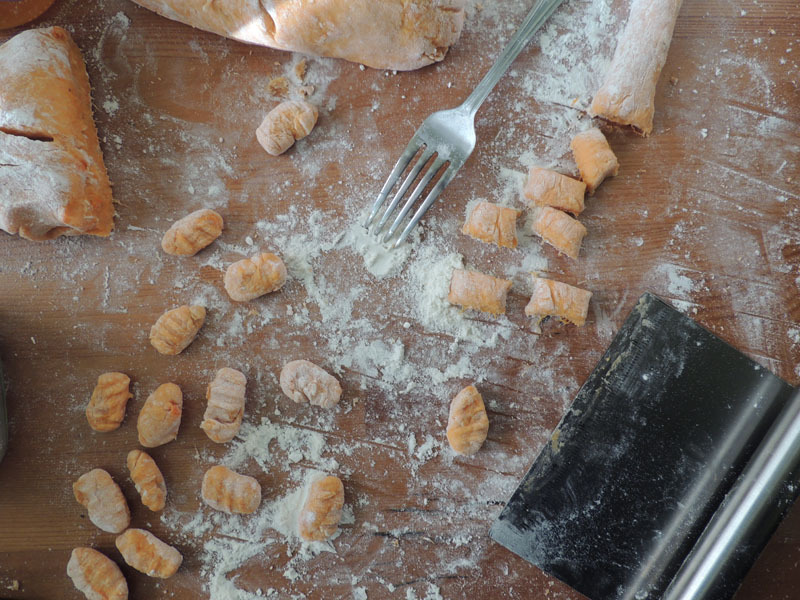 Gnocchi are no joke – they take a while to make because you have to add the flour slowly to make sure the consistency is right, and then you have to roll and cut them individually. These gnocchi, made with sweet potatoes in addition to regular potatoes, have a touch of sweetness that goes well against a saltier sauce. You can serve them with sage brown butter or the kale and bacon version I have here. Heat the oven to 400F. Slice all the potatoes in half (so they are roughly the same size), lightly coat with olive oil, and season with salt and pepper. Put the potatoes cut side down onto a baking sheet and bake for about 30 minutes, or until tender. Let cool, then remove the skins and put through a potato ricer. You may also mash with a fork, but make sure to mash the regular potatoes separately first – they don’t mash as easily as the sweet potatoes will. Add the egg, mix well, then add the Parmesan cheese and salt. Stir in the flour 1/4 cup at a time, until it reaches the right consistency. You will know when it’s ready when the dough is still soft but doesn’t stick to your hands. Divide the dough into 4, then roll into long pieces so you can cut them into little pillows. If you want, roll each piece over the tines of a fork to make the ridges (see photo). Dust pieces with flour so they don’t stick. In a skillet, fry bacon over medium-high to high heat. Drain some of the bacon fat from the pan, and add kale. Add the butter, and then the gnocchi. 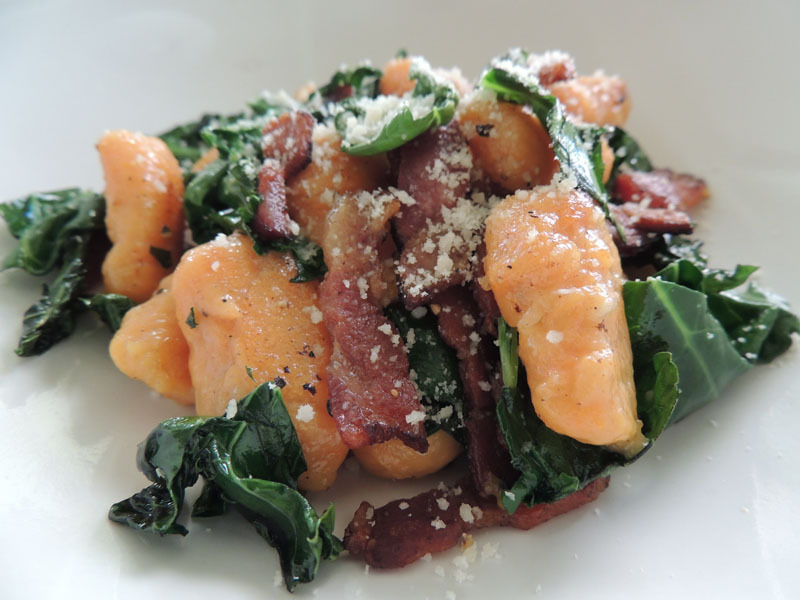 Toss everything together – I personally like to brown the gnocchi a little bit. Top with grated Parmesan cheese and serve immediately. vintage post: tapas at home.